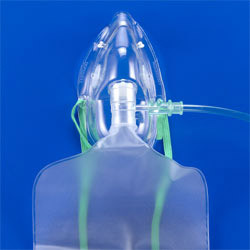 Non rebreathing high concentration mask-adult. 1． Soft, clear and lightweight for patient comfort. 2． Elongated design and visual patient assessment. 3． Adjustable nose clip and elastic head strap assure comfort and safety. 4． Non-rebreathing design, low resistance inspiratory and expiratory valves. 5． Complete with 7 ft. oxygen supply tubing. 6． Adaptor swivels to fit patient position.